For video tutorials on using VLA, click here. If you are having difficulty attaching a video from your iphone to the question section, follow the simple steps. 1. Record video on phone. 2. Email video to self on computer. 3. Open email and save video to computer. 4. In question section, click “add file” and select video from computer. Java put out an update and it is causing problems with some applications using Java. Java has put out a workaround to get past the issue so you can continue to use your applications that use Java. As a workaround, the user can use Exception Site list feature to run the applications blocked by security settings. By adding the URL of the blocked application to the Exception Site list allows it to run with some warnings. * Click OK to save the URL that you entered. 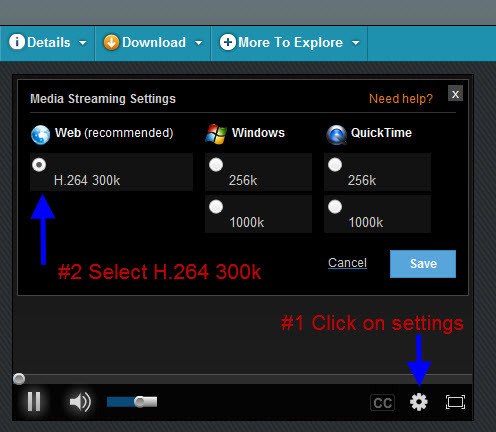 The student needs to open the video, once it opens on their screen they need to click on the settings button as shown in step #1 below, under Web (recommended) select H.264 300k as shown in step #2. Trying to complete editable PDFs in Chrome or on Chromebooks? 1. Click to open the pdf and type in the responses (fill out the check). 2. Click PRINT, when selecting printer click PDF and save to the computer. 3. Attach the file to the question section. Why am I returned to the login page when I click the Save button? 1. Click Tools > Internet Options. 3. Disable the Content Advisor. I have a unit to redo but cannot type in the answer box. For a student to redo a question, the background color of the question must be gray. If it is pink, the student must send this unit back to the teacher to be graded again. The teacher must choose which question(s) the student should redo. Those questions should each be marked Redo, not Incorrect. The teacher must then choose This unit must be redone at the top of the page. I cannot access the read-aloud capability in Adobe Acrobat Reader 8. To access the read aloud capability in newer versions of Adobe Acrobat Reader, download the newest version of Acrobat Reader at https://get.adobe.com/reader/. After installing Acrobat Reader, open the program, and click edit. Click on Internet, and make sure Display PDF in Browser is NOT checked. Click OK. Note: You may have to restart your computer. Log in to your VLA account, and click on your unit. Click the PDF File link at the top of the unit. The unit will open in a new window with a menu along the top. On the new menu, click View > Read Out Loud/Activate Read Out Loud. You may also opt to use the keyboard shortcut Shift+Ctrl+Y. Click the paragraph you would like to have read. The voice will read the highlighted text. Note: To read entire page, click > View > Read Out Loud/Read This Page Only. You may also opt to use the keyboard shortcut Shift+Ctrl+V. To stop the reader, keyboard shortcut Shift+Ctrl+E. *Note: The read aloud voice is dependent upon your version of Windows. Windows XP uses a male voice, and Windows Vista uses a female voice. We have found that "Puffin" is the best web browser for displaying Flash content in VLA. You can download this app from the iTunes App Store. Puffin is free for 14 days, or you can purchase it for $2.99. I'm a Mac user. How can I get my PDF file to read aloud? Open the PDF file, and highlight the portion of the text you would like to hear. Click Safari > Speech > Activate. I cannot access the videos. QuickTime must be installed on your computer to access the videos. Download this free program at http://www.quicktime.com/. I am using Internet Explorer 8 and cannot access the videos. Quick Fix: When the security warning box appears, select No. You will need to do this each time you wish to access video content. In the Miscellaneous section, change Display mixed content to Enable. Once I have logged in, I select a course and choose a unit to work on. The program returns me to the login page. We believe this to be a cookie setting error. Please adjust your browser to always allow session cookies. The following directions may help to make this correction. ChooseTools > Internet Options from the menu. Check Override automatic cookie handling and Always allow session cookies. Note: The user can choose to Accept, Block, or be Prompted for First-Party Cookies or Third-Party Cookies. I forgot/lost my username and/or password. Contact the VLA Point of Contact at your school. This individual has access to all login account information. I cannot access the website. I am using the correct site but still cannot access the login page. Make sure you are using Internet Explorer 6.0 or higher as your browser, and a Windows 98 or higher operating system. I can access the login page with my username and password, but my units are appearing blank. I am using Internet Explorer 6.0 or higher, but the units are still blank. At this point, you may need to change the security setting on your browser. Change the privacy setting to medium or low. My math courses will only print one page of content. Click the PDF File link that is located at the top left hand corner of the page within the content. Once the content is opened as a PDF file, you will be able to click on the Printer Friendly button on the left side of the screen, and all pages of the content will print. I use a Mac and don't have a Ctrl key for special characters. I am unable to record audio. The latest version of Java must be installed on your computer in order to record audio. If you are having difficulty, please go to: http://www.java.com/ and click on " Free Java Download." For Windows users, you will then click on "Agree & Start Free Download." For other operating systems, click on the "All Java Downloads" link to find your specific instructions. When you open the audio recorder for the first time you must click the next button to activate the recorder. You may need to restart your browser to enable the installation. How to Use the Print Screen Function on a Mac. Hold down Apple key + Shift + 3 simultaneously to get a picture of your entire desktop. If your audio is turned on, you will hear a click similar to that of a camera. You will then find a picture on your desktop entitled "Picture N", being the first unsued number. Hold down Apple key + Shift + 4 and release to capture a certain area of the screen. A cropping tool will appear and you can select the area of the screen you would like to cature. To do a screen capture of a specific application window, hold down Apple key + Shift + 4 and release. Click the spacebar and a camera icon will appear. Move this icon to the application window you want to capture and press "Enter."